Definition "An act of spontaneous selfless service in the face of risk to life or threat of physical injury and or an act of courage and daring against a social evil/crime". Process of inviting applications: Wide publicity is given for the Programme.. Nominations are invited through State/Union Territory Councils of ICCW, various Departments of the State Government including Director Generals and Commissioners of Police of States and Union Territories. Process of applying: Nominations are received in the prescribed Application Form which can be obtained from ICCW Office, New Delhi. The Application should be recommended by two of the listed Competent Authorities. The form is to be accompanied by a write-up of about 250 words giving the details of the deed performed by the applicant, proof of date of birth, Newspaper/Magazine clippings and or the First Information Report (FIR) or Police Diary filed with the Police Station. The account of the incident as well as the supporting documents should preferably be endorsed by two of the listed Competent Authorities. Age-limit: The child should not be below 6 years and above 18 years of age on the date of the incident. Date of Incident: Incidents which have occurred between July 1 and June 30, every year are considered. The Selection Committee, may at its discretion, relax the date by a maximum period of three months prior to July 1. Recommending/ Competent Authorities: The application must be recommended by any two of the following: Principal/Headmaster of school in which the applicant is studying or Head of Panchayat/ Zila Parishad General Secretary or President of the State Council for Child Welfare. Collector/DM/Govt. Official of equivalent rank Supdt. of Police of the area or Police Official of higher rank. Date of submission of Application: Last date of submission of application is September 30. Selection Procedure: The selection is made by a high powered Committee constituted by ICCW comprising representatives from Secretariats of the President of India, Vice-President of India, Ministries of Human Resource Development, Women & Child Development, Youth Affairs & Sports, Social Justice & Empowerment, Health & Family Welfare, Railways, Defence, Home Affairs, Labour, Rural Development, Information & Broadcasting, AIR, Doordarshan, Police, some NGOs, Office-Bearers and members of the Council. Applications once rejected will not be entertained again. The Selection Committee may at its discretion consider relaxation of any of the conditions/rules if it so deems fit. The decision of the Selection Committee shall be final. 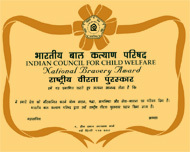 Award: The Awardees receive a medal, a certificate and cash award. Gifts are given by philanthropic organizations. Additional Benefits: Eligible awardees are granted assistance until they complete their schooling. ICCW provides financial assistance under its Indira Gandhi Scholarship Scheme to those undertaking professional courses such as engineering and medicine and to others till they complete their graduation.